The Llama doesn't have many ways to protect himself. So it's obvious that he's going to have to launch poisonous spit to knock those punk zombies out! Hawk loogies at the visitors to totally take them out before they escape this weird zoo! 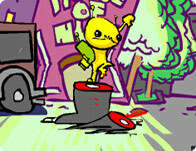 Use your mouse to click on and shoot at the invading visitors.